Organise your home, garages and workshops with PVC Garage Slatwall. Designed to help you "reclaim the floor" by maximising your wall storage capabilities. Customise your storage space with ease by adding accessories. Endless storage possibilities are at your fingertips with these versatile and easy-to-install panels. 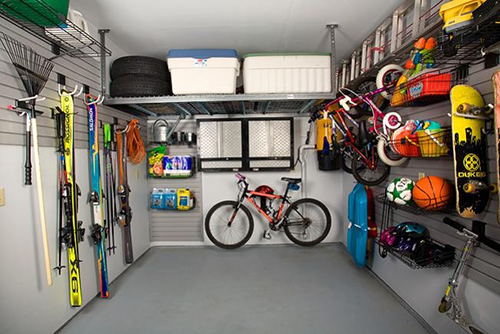 When the majority of your garage space is occupied by a vehicle or two, you need space for storage of tools and equipment. The use of garage slatwall is a great way of organising your garages and workshop by maximising your wall storage capabilities. With these versatile and easy to install panels that come with numerous hanging accessories, you can customise your limited storage space in many different ways. There are different Slatwall accessories suitable for the storage of various equipment and tools. They include specially designed hangers, hooks, and racks that are suitable for storage of sporting gear, fishing gear, camping equipment, garden tools and equipment, craft items, toys, hobbies, retail items and much more. With the single prong and double pronged slat wall hooks and the ladder loop hooks, you will be able to transform any garage wall into a beautifully organised space. Slatwall accessories are designed for easy use with the panels. They come with rubber protected hooks for user safety and are maintenance free. If you have fewer storage items, you can always start with a single panel kit, and add extra accessories according to your storage requirements. The kits come with installation instructions for easy set-up.